Someone is trying to resell my painting of Michelle Obama and Daughters for $75,000 on Ebay, painted by 'the painter of the stars.' 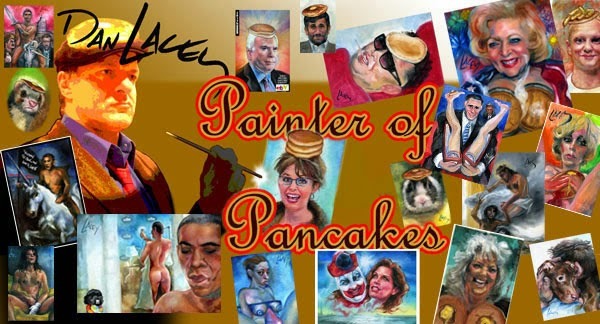 I guess 'The Painter Of Pancakes' doesn't sound as impressive. It's a nice painting. Good luck to them! Second study of my Dirty Show / Angelina Jolie / Obama Unicorn painting, in progress. Right now my plan is to have both Jolie/Obama studies and one larger finished version of the same for the show. I've been concentrating so completely on these paintings, and also on completing a few commissions, that I haven't had time to post anything new for auction on Ebay. Hopefully I'll have some new YouTube paintings before too long. Found some time to respond to newer comments. Out of necessity I had to drop my Echo comment subscription, and by doing so it dropped a load of previous comments from this blog; however, I was able to save a chunk of comments without reference to the original blog posts as an xml file. A better image of my Obama / Jimmy McMillan 'The Snow Is Too Damn High' Unicorn painting. Obama Jimmy McMillan Unicorn Painting. Replacement for McMillan pancake portrait, which disappeared in the mail. Working on the Angelina Jolie Obama Unicorn study at a Caribou Coffee in Fridley. The paintings at 2:12, 2:53 (the preview image) and 3:37 aren't mine, though. Dirty Show 12 Angelina Jolie / Obama Unicorn Painting study, in progress. The larger version of this painting will be 36 by 48 inches. Second version of a previous Michael Jackson painting, for Irene. A collection of previous Rush paintings. Working on a new YouTube painting in my wife's hospital room.